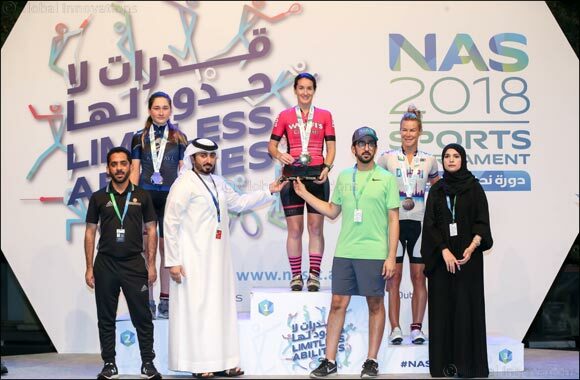 Dubai, UAE, May 28, 2018: Mehnaz Amin Kamali, winner of the women’s 75km amateur cycling race for UAE Nationals on Sunday night, dedicated her triumph to Mizna Abdullah Ali, who was killed by a speeding car last week while she was training for Nad Al Sheba Sports Tournament’s cycling competition. Mizna, a member of the Al Wathba team, was cycling with a few of her teammates on Meydan Road on Wednesday night when she was hit by a speeding motorist. She was rushed to hospital, but succumbed to her injuries. Mehnaz, a doctor by profession who was taking part in the Nad Al Sheba Cycling competition for the first time, said: “I dedicate this win to Mizna Abdullah, who passed away in a tragic accident last week. My deepest condolences to her family. Mizna’s Al Wathba teammates also remembered her on the night, holding banners at the starting line with “#Mizna” written across them. “The death of Mizna is a really painful moment for us all,” said Sulaiman Al Hammadi, the director of the Al Wathba cycling team. “Tonight, she was supposed to be standing here with her teammates on the starting line, hoping to achieve one of her most important goals - of winning this race – for which she had been training for a long time. “To honour her memory, we took part in the race because we know she would have been happy to see us race if she was here with us. Also, we raised a hashtag bearing her name at the starting line. This is the least we could have done for her. In the men’s 75km amateur race for UAE Nationals, 2017 champion Adel Abdulbaqi Al Balooshi topped the podium once again, and was followed by Rashid Mohammed Al Balooshi and Abdulla Hussain Al Balooshi in second and third respectively. Racing in the colours of Team Expo Dubai 2020, Adel said he had been training hard for NAS Cycling championship, riding 100km to 120km every day despite his work commitments. “I have been cycling from a young age, but I had to drop out of training with Al Nasr because of my academic obligations,” he said. “I am back in training but I cannot join a club or a professional team, despite the many offers I received after winning last year’s NAS Championship, because I am unable to commit to regular training. Open Category - Men: Majid Al Balooshi; Mohammed Al Murawwi; Mohammed Al Mansoori. People of Determination (Road Bike): Abdulla Al Balooshi; Abdulla Al Hammadi; Hamdan Ali.